Debbie Lynn Grace Delivers Big Impact Through Heart, Inspiration and Soul Lifting Keynotes! It’s the obstacles, challenges and unexpected opportunities that truly lead you to discover your higher calling. For Debbie Lynn Grace, the road to her purpose felt like an unconventional route and path she had never envisioned for herself. Now each step on her path makes perfect sense and she feels truly blessed to show people worldwide how to live an aligned life of purpose, love, passion, creativity and prosperity. Debbie is an author, transformational leader, gifted intuitive, energy worker and business growth expert. Over the last 30 years she has inspired hundreds of thousands of people across the globe take their lives to a new level of growth and unlock their own personal power. In her transformational and engaging keynotes, Debbie delivers a captivating, witty and inspirational message that will speak to the heart, mind and soul of your audience members. She will show you how to quickly dissolve all the energy blocks in your life that stop you from achieving a life of fulfillment, purpose, love, passion and prosperity. From 30 minutes to a 3-day retreat, Debbie Lynn Grace can customize the program that uses easy to implement tips and strategies that help you create limitless success in your life. Click here for Debbie’s availability. WHY you can still get triggered into fear, lack and constriction even if you have spent years working on your own personal development. WHY the four biggest excuses of a lack of time, money, education and support are NOT the REAL energy blocks holding you back from getting what you want and what is. WHY you can fall into a cycle of self sabotage and procrastination even when you have a plan which will improve your situation. WHY the law of attraction can work against you. WHY trying to change your belief systems is NOT the most effective method for changing your circumstances and what is. The 5 ESSENTIAL ingredients that MUST be present for a permanent transformation so you get out of the pattern of hard work and struggle. How to transform hard work and struggle and “confusion” into some of your greatest SOUL work. The 3-step formula that DISSOLVES ALL the energy blocks holding you back from manifesting EVERYTHING you really want. How to be more resilient as a leader when thrown obstacles in the path of our mission. How to inspire deeper loyalty and a stronger connection from your following, employees or clients. The one thing that goes against what you are taught in school about success that will make you stronger and more impactful as a leader. How to stay calm and centered in spite of the many demands placed on you daily as a leader. Why what you do and say is only 10% of your effectiveness as a leader and why the other 90% is the most crucial to make a greater impact. Of all the programs I’ve had the pleasure of attending over the years, yours was without a doubt the most inspiring, practical and fun session I’ve ever experienced. You immediately connected with everyone in the audience. And your successfully balanced a refreshing self-deprecation with a wealth of valuable tips, making you both approachable but powerful enough to give us a swift kick in our assets. Thank you for sharing your vision, your experience and your humor. Debbie, thank you for an excellent presentation. You were speaking to a crowd who sometimes think they’ve heard it all. Yet you easily won them over with your engaging style. Several of our attendees commented to me yours was one of the best presentations we’ve ever had. They found that you stood out because you offer such valuable content in your talk and make it fun too. Please accept my words of appreciation. We received rave reviews for your program. Our evaluations were glowing with praise and ranked your session as the best in the entire conference! Debbie, you’re tops in my book! You received the highest rating ever received for 27 presenters in our event’s three-year history. I put a high value on the professionalism you exhibit. Everyone had only rave reviews for your program. Debbie. Your program was so inspirational and a hard act to follow. I have nothing original to say to you, just the same old words you hear all the time. YOU ARE INCREDIBLE! As I looked around the audience throughout your program, I spotted people having their own “ah-ha” moments. It was an honor to have you on our program. I thank you for being such a dynamic, inspiring and informative public speaker. May we all take your many lessons to heart for more rewarding lives. I had the pleasure of experiencing a keynote address by Debbie. Concise and direct, her message was delivered with clarity, concern, and humor. So powerful was her presentation that I was completely engaged. Debbie doesn’t just talk, she delivers viable tools that can be easily implemented. Debbie, I want to thank you for your marvelous presentation. It was absolutely topnotch…totally practical and packed with sensible suggestions I can apply immediately. The day with you was like watching an Oscar winning film – I was left kind of speechless and have been thinking about your program ever since. Hospitality Sales And Marketing Association Intl. 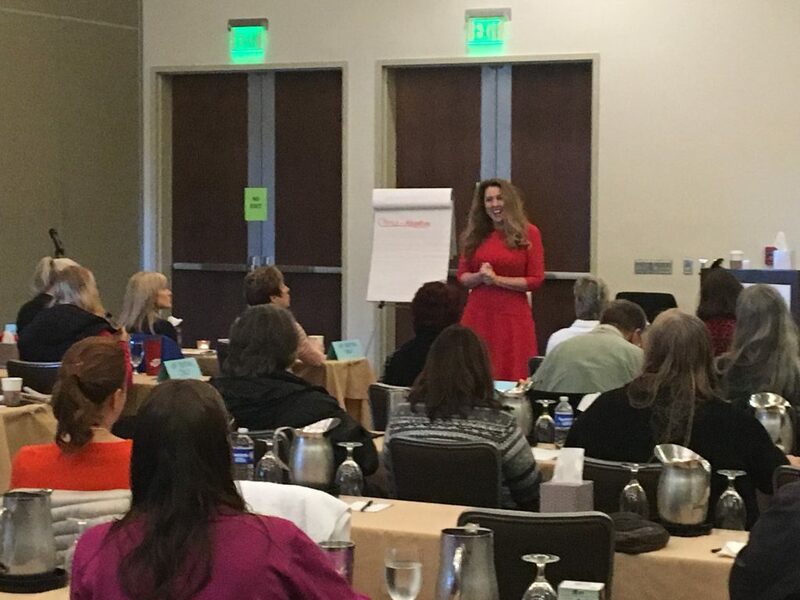 Contact Customercare@Debbielynngrace.com for more information on customizing a message for your conference, retreat, program or meeting and for Debbie Lynn Grace’s availability.